Fellow Celiacs and/or food allergy sufferers understand the need to eat primarily homecooked food….takeout and otherwise prepared food can be iffy, so homemade is always the safest way to go. Unfortunately, this can mean lots and lots of cooking and time spent in the kitchen – but it doesn’t have to be that way if you plan it right. I bring homecooked lunches to work everyday, and many of my coworkers ask me how I find the time to do so much cooking. So here’s my secret: Meal Prep Sunday (or sometimes Saturday). Preheat oven to 350 degrees Fahrenheit. While oven is heating, fry up 2 slices of bacon in skillet and put the whole chicken in a roasting pan and pat dry (be sure to remove any giblets in the cavity, if present). When the bacon is cooked, remove the bacon slices and pour the bacon fat all over the chicken. Bacon slices can be discarded (or eaten!!). 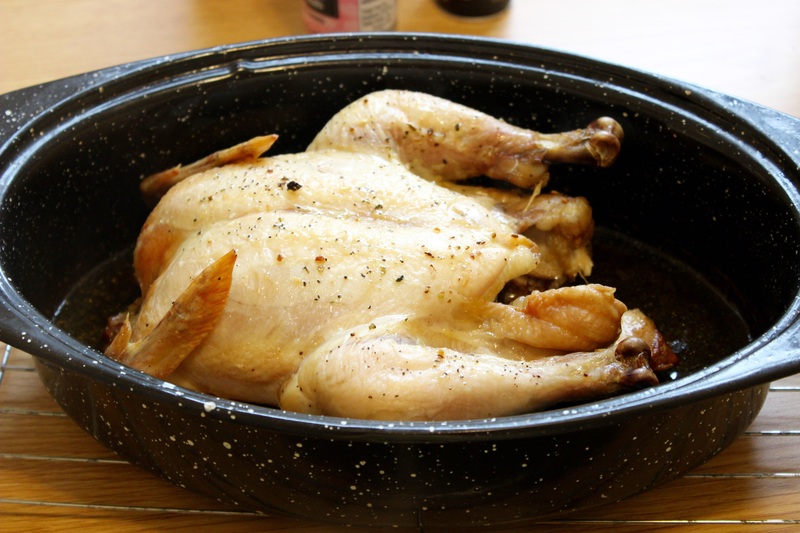 Place chicken in oven and set timer for 2 hours. Money saving tip #1: Pasture-raised chicken can be expensive, but I was able to buy this bird for $11 during a sale at Whole Foods. I picked up a second for the freezer, too. Stocking up on expensive meat during sales and freezing it for later is a great way to save money in the long-term. Time to cut up the veggies! 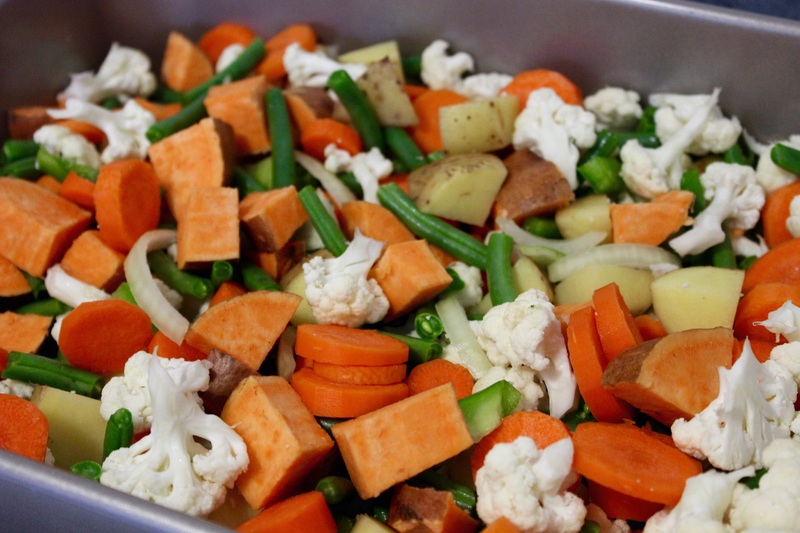 Once all your veggies are cut up, place them in a roasting pan. Cut up 4 slices of uncooked bacon and sprinkle on top of the vegetables (while cooking, the bacon fat will coat the vegetables and give lots of flavor to the whole pan). 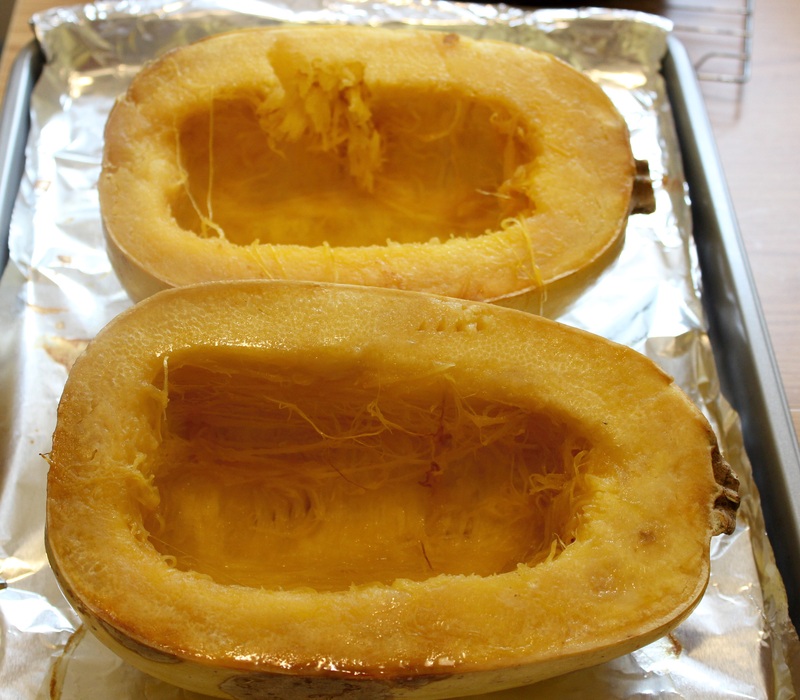 Place squash cut-side down on a baking sheet lined with aluminum foil. Money saving tip #2: Save a few pieces of onion & carrots and freeze in a plastic freezer bag – these will be great for flavoring a future batch of chicken broth, made with the bones of the cooked chicken! Money saving tip #3: Buy your produce at a farmer’s market or farmstand. Organic produce tends to be a lot cheaper coming straight from the source and without packaging. I bought cauliflower, sweet potatoes, white potatoes, green peppers, green beans, carrots and onions for $11.00. Money saving tip #4: Buy ‘seconds’ or clearance produce if you plan on using it right away (or freeze it!). I bought two giant spaghetti-squash halves on clearance for 99 cents each. Place pan of veggies and sheet of spaghetti squash in the oven. You’ll have 30 minutes of down time – use this time to clean up the kitchen or do whatever else you need to get done – I threw in a load of laundry and folded another while I waited. Give the veggies a quick stir to distribute the melting bacon fat and return to oven. Again, 30 more minutes of down time – go get another chore done! Take chicken, veggies and spaghetti squash out of oven and place on drying racks to cool. All the cooking is done! 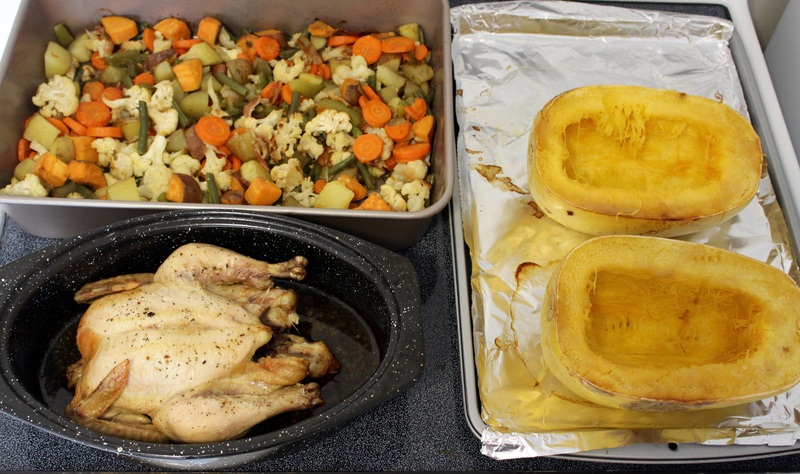 Slice up the chicken and put it into individual containers, along with the roasted veggies. Use a fork to shred tender insides of the spaghetti squash and place those into containers as well. I put some of the food in the fridge (for now), and some of it in the freezer (for later). Adding a simple jarred sauce to the spaghetti squash makes for a quick and tasty meal later in the week! Money-saving tip #5: Don’t discard those chicken bones! The whole carcass can be thrown into a plastic bag in the freezer and be used to make homemade chicken broth another day. The squash part is very unique!